A very important part of becoming fluent in English is speaking clearly and in a way that other people can understand you easily. Our voice recognition feature is therefore a really important tool you can use to make sure you do not have pronunciation mistakes that affect the clarity of your message. 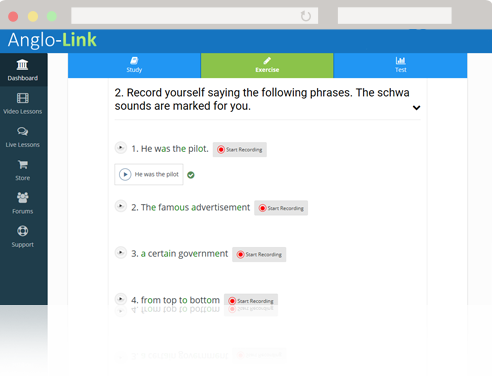 Our software allows you to record yourself reading certain words or phrases. It then 'tells' you if it 'understood' what you said. To assist you, you can listen to the teacher's recording of the word or the phrase several times before you try it yourself. You also have the option to listen to your own recoding. Not all devices support our voice recognition software.